It’s a dog-eat-dog world, so the saying goes. The culture of friendly competition is spreading at CBE. 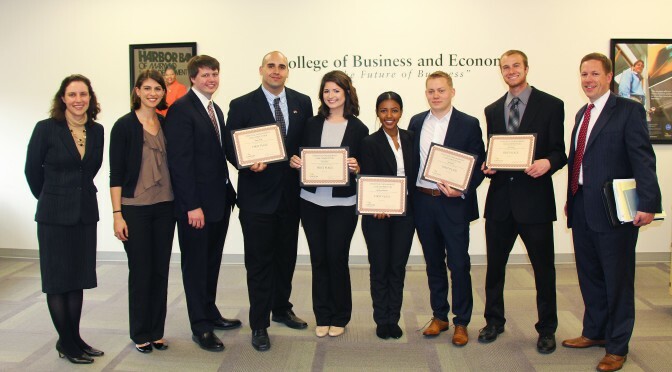 In 2014, the college welcomed its inaugural case competition in supply chain management, marketing and finance. Local business partners provide cases and act as judges as teams present their findings. The winning teams are invited to the Weinman Cup competition, a regional event hosted by Towson University. Students interested in sales and personal selling now have the opportunity to compete for a title in the CBE Sales Competition. The inaugural sales event, in fall 2015, enabled participating students to sell a product. Videos captured students’ interactive sales pitches in real time for the judges to evaluate in a separate room. Competitors were judged on their poise, persuasiveness and presentation skills. Finally, we are pleased to announce the largest initiative in the MNGT 481 Strategic Management Case Competition. With this new project, all accounting, business administration and e-business majors will participate in a case competition as seniors in the MNGT 481 Strategic Management course. Students will be divided into teams and given a real business problem or questions presented by a local partnering company.